Ingrown toenails are nails that have grown into the soft skin that surrounds the nail bed. In many cases, it is the corner of the nail that curves downward into the skin. However, the entire side of the nail may grow into the skin as well. Many ingrown toenails can be resolved at home by frequently soaking the foot in warm water. However, some ingrown nails do not resolve with home remedies and instead require medical attention. that ingrown toenails are a very common condition? In fact, 1 in 20 people get one every year. Both genders are susceptible to ingrown toenails, but women are most likely to develop the condition – often due to the strain placed on feet from narrow, pointed, high-heeled shoes. In most cases, it is the big toe affected by an ingrown nail. 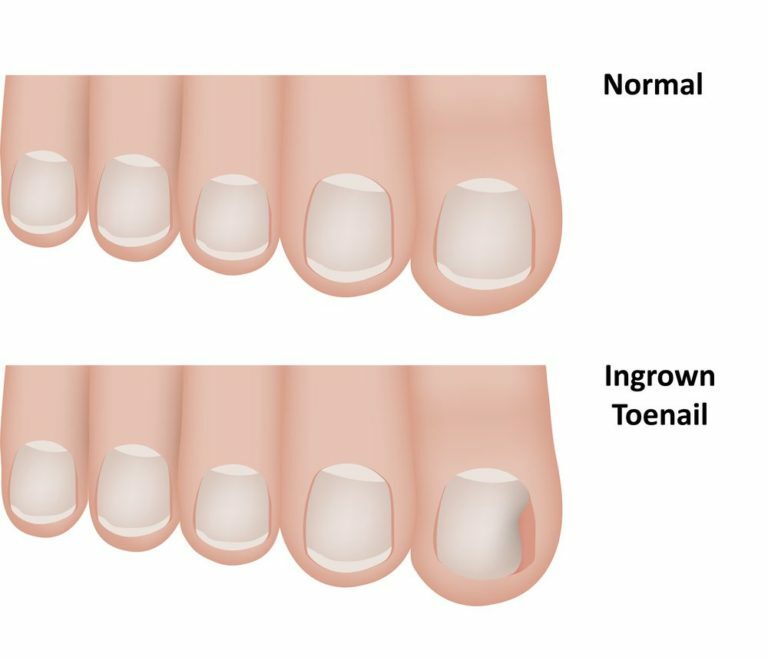 How do I know if I need ingrown toenail treatment? You may need to visit an urgent care center if you have severe pain or swelling around one of your toenails. The toe may also be reddened and tender near the ingrown nail. It is important to seek medical attention for an ingrown toenail to ensure that it does not become infected. How will my doctor treat my ingrown toenail? If your toenail is only slightly ingrown, your doctor may lift the nail, separating it from the skin using a splint. Standard treatment for a severely ingrown toenail involves removing the portion of the toenail that has grown into the skin. Your toe will first be numbed, and sterilized surgical scissors will be used to carefully cut along the nail. The doctor will then dress and bandage the toe, sending you home with topical ointments and instructions for post-treatment care and follow-up. Your toenail should re-grow within a few weeks. Is there anything I can do to prevent ingrown toenails in the future? Yes. When trimming your toenails, cut them straight across instead of rounding them. You should also check your shoes to ensure there is plenty of room for your toes. Cramped toe space raises your risk of ingrown toenails.